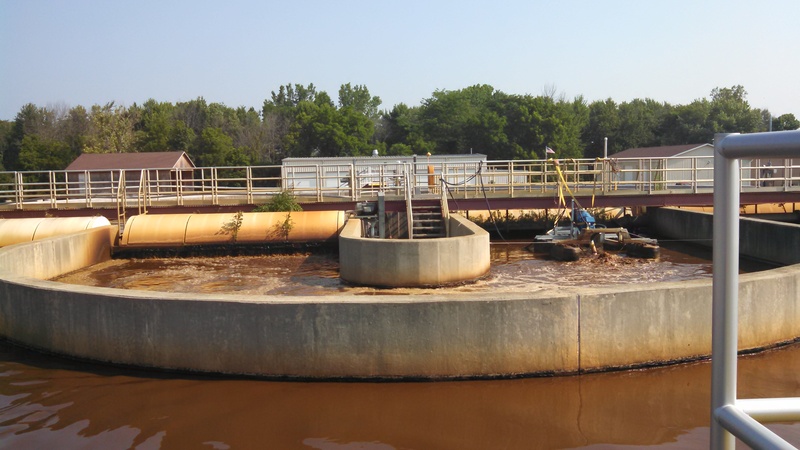 In 2012, the Middlebury, Indiana, USA Wastewater Treatment Plant (WWTP) was faced with aging brush rotors and higher loads in their oxidation ditch system. When Mick Reese was hired as Plant Superintendent, the upgrade design was about 90% complete. The full system upgrade included adding an outer ring to the existing oxidation oval, construction of a new clarifier, controls building, and a sludge processing system. The plant upgrade also included a PLC based aeration control system capable of reducing energy consumption by maintaining an optimal DO level. The plant treated approximately 600,000 gallons per day and it was time to upgrade their system to accommodate higher flows and loadings and increase the reliability of the system. Middlebury worked with the consulting engineering firm, Donahue & Associates, for the plant upgrade. Donahue & Associates partnered with Aeration Industries International to develop a system upgrade that could be completed while the existing plant was kept in operation. The first phase of construction consisted of constructing a new outer ring without interruption to the current system. During the first phase of construction, one of the rotors from the old system broke down, while simultaneously facing increased loads due the treatment needed from a local food processing plant. Reese debated fixing the broken brush rotor, but realized the cost would be approximately $15,000-$20,000 and likely would not be a reliable option in the long-term. Middlebury was in need of aeration to avoid violating effluent limits. Aeration Industries was able to provide a rental Aire-O2 Triton® to keep the plant operating. Once the new ring was operational, the inner rings were drained, cleaned, and four Aire-O2 Tritons were installed; two 30hp in the middle ring and two 20hp Tritons in the inner ring. “I couldn’t be happier to see the rotors go,” said Reese. As Reese says, “the aerators are doing wonderful.” The original system had a design flow of approximately 600,000 gallons per day and is now able to treat 67% more per day. The treatment plant is also able to utilize reclaimed water. Originally the treatment was using 250,000 gallons of water and now that has been cut to 2,000 gallons. Reese attributes the decrease of using city water to the improved system. Reese appreciates the customer service and location of Aeration Industries. Having both organizations located in the Midwest made it easier to plan for the cold winters and seasonal changes in the system design. Not only did the treatment plant upgrade increase the organic loading capacity by 67% but it also significantly reduced the required maintenance. Reese checks the equipment frequently, but has not had to remove any of the equipment out of service for maintenance. Questions on how we can help you increase treatment capacity and reduce time spent on maintenance? Contact us at +1-952-448-6789 for more information. Together, we can create innovative solutions for your wastewater challenges.